Today, as President Obama went to Ohio State University to discuss the all-out, all-of-the-above strategy for American energy, the White House announced new funding to advance the development of American-made small modular reactors (SMRs), an important element of the President’s energy strategy. A total of $450 million will be made available to support first-of-its-kind engineering, design certification and licensing for up to two SMR designs over five years, subject to congressional appropriations. Manufacturing these reactors domestically will offer the United States important export opportunities and will advance our competitive edge in the global clean energy race. 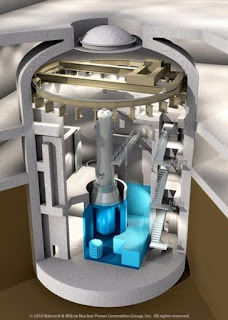 Small modular reactors, which are approximately one-third the size of current nuclear plants, have compact, scalable designs that are expected to offer a host of safety, construction and economic benefits. Through cost-share agreements with private industry, the Department will solicit proposals for promising SMR projects that have the potential to be licensed by the Nuclear Regulatory Commission and achieve commercial operation by 2022. These cost-share agreements will span a five-year period and, subject to congressional appropriations, will provide a total investment of approximately $900 million, with at least 50 percent provided by private industry. SMRs can be made in factories and transported to sites where they would be ready to “plug and play” upon arrival, reducing both capital costs and construction times. The smaller size also makes SMRs ideal for small electric grids and for locations that cannot support large reactors, offering utilities the flexibility to scale production as demand changes. · In 2010, the Department signed a conditional commitment for $8 billion in loan guarantees to support the Vogtle project, where the Southern Company and Georgia Power are building two new nuclear reactors, helping to create new jobs and export opportunities for American workers and businesses.